Please find instructions for submitting proceedings here. Proceedings will be published electronically and are encouraged to be a concise 6 pages. All submissions are expected to be received by 1 Mar 2013. 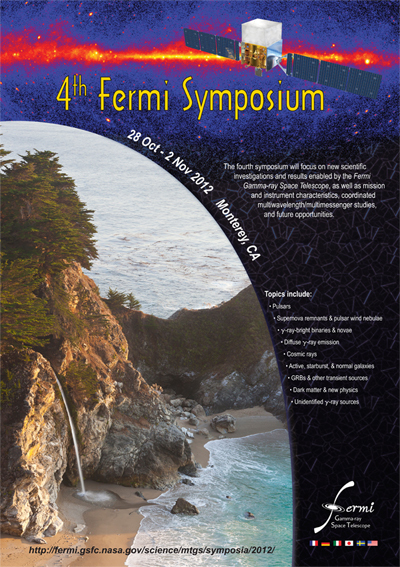 This symposium follows previous Fermi Symposia at Stanford (February 2007), Washington DC (November 2009) and Rome, Italy (May 2011). The two Fermi instruments have been surveying the high-energy sky since August 2008. The Large Area Telescope (LAT) has discovered more than a thousand new sources and many new source classes, bringing the importance of gamma-ray astrophysics to an ever-broadening community. The LAT catalog includes supernova remnants, pulsar wind nebulae, pulsars, binary systems, a nova, several classes of active galaxies, starburst galaxies, normal galaxies, and a large number of unidentified sources. Continuous monitoring of the high-energy gamma-ray sky has uncovered numerous outbursts from a wide range of transients. Fermi LAT's study of diffuse gamma-ray emission in our galaxy revealed giant bubbles shining in gamma rays. The direct measurement of a harder-than-expected cosmic-ray electron spectrum may imply the presence of nearby cosmic-ray accelerators. LAT data have provided stringent constraints on new phenomena such as supersymmetric dark-matter annihilations as well as tests of fundamental physics. The Gamma-ray Burst Monitor (GBM) continues to be a prolific detector of gamma-ray transients: magnetars, solar flares, terrestrial gamma-ray flashes and gamma-ray bursts at keV to MeV energies, complementing the higher energy LAT observations of those sources in addition to providing valuable science return in their own right. Here is the preliminary scientific program, plenary speakers, and poster information. Please visit the Local Information pages to make a hotel reservation as well as for more info. If you find the hotel reservation website unavailable, please call 1.800.233.1234 to make your reservation. The special rate ($134) remains available to Symposium participants.